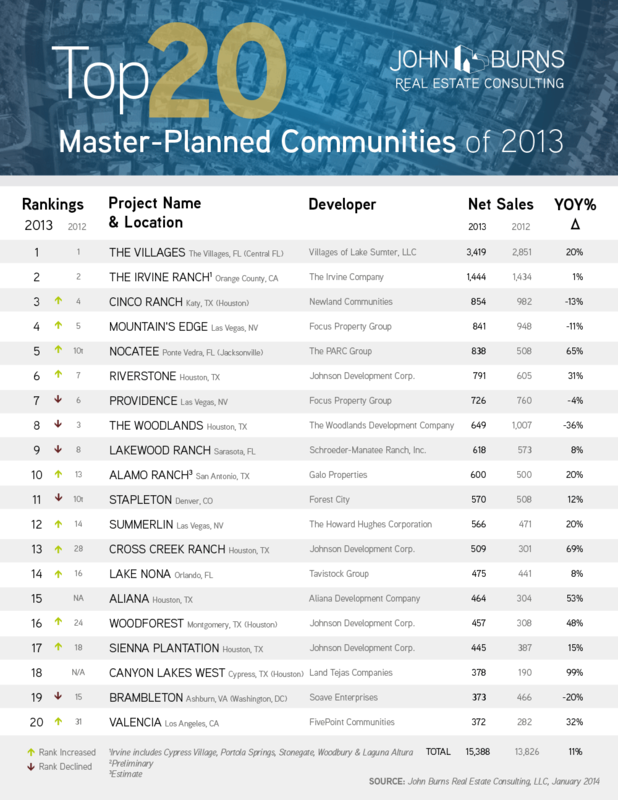 The top 20 master-planned communities in the country sold 15,338 homes in 2013, which is an 11% increase over 2012. With 9 communities, Texas dominated the list. Florida had 4, Nevada had 3, and California had 2. Colorado and the DC area round out the list. We will release our complete ranking of the top 50 selling communities this week. Only 5 new communities joined the list, and 9 of the top 20 remained the same as last year, which is a reflection of how few new master-planned communities have started recently. Our consultants know this will change, however, as we consulted on dozens of planned new communities in 2013. We contacted our colleagues at more than 100 master-planned communities (MPCs) nationwide to complete our ranking. Active adult drives #1 rank. 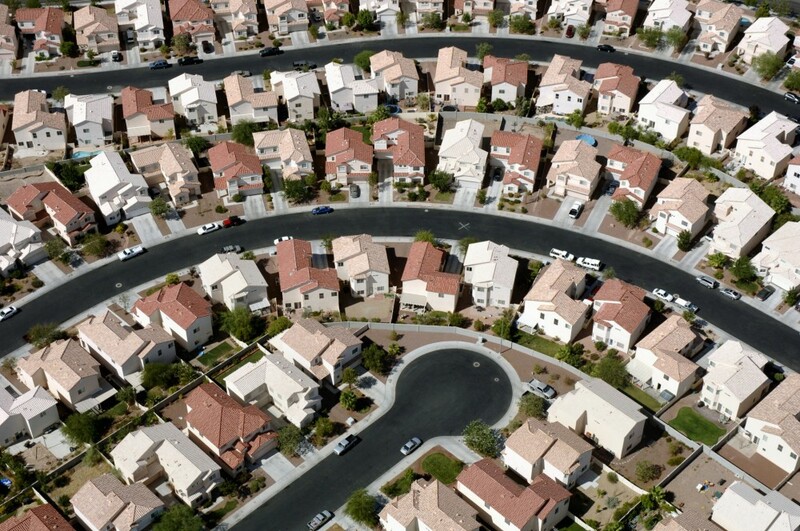 Once again, The Villages in central Florida led with 3,419 net new home sales in 2013 – a 20% increase over 2012. Active adult communities all over the country had an excellent year in 2013 due to great demographics, a strong stock market, and well qualified buyers with no legacy mortgage issues who found it easy to sell their existing home.If you are a developer and haven’t had the chance to take the bus tour at The Villages that is offered every hour, we highly recommend it. Foreign buyers drive #2 rank. The Irvine Ranch in Orange County, CA retains the 2nd spot in our ranking with 1,444 net new home sales- consistent with last year’s strong showing. Buoyed by strong local economies and a great exchange rate, Asian buyers (excluding East Indian) comprised 53% of new home sales in Irvine. Schools were the number one attraction. We recently issued a 50-page white paper for our clients on foreign buyer activity, and are monitoring several new indicators to keep our finger on the pulse. Flawless execution behind ranking #3. Newland Communities’ Cinco Ranch in Houston captured 845 (preliminary) sales for the third-highest sales activity in our survey. Sales fell in Cinco Ranch as well as in four of the other 20 largest communities and 26% of the top 50 communities, due to lot availability rather than consumer demand. Builders in Cinco Ranch maintained strong pricing power because the community has been so well executed. Houston Leads the Way. Amazingly, eight of the top 20 best-selling master-planned communities are located in the Houston MSA, where consumers highly value the MPCs due to lack of zoning outside MPCs. Among the top 20 communities, Canyon Lakes West in Houston (#18 developed by Land Tejas) reported the largest annual increase at 99%, followed by Johnson Development’s Cross Creek Ranch in Houston (ranked #13) with a 69% net sales increase over 2012. Our consulting team members have visited or consulted on all of these communities recently and can answer any questions you may have. or Jody Kahn (603) 235-5760 for more information.